The recent months have not been very successful for the cryptocurrency industry. With lower volatility, the main markets have been gradually moving south since at least January 2018. The lack of big buyers has been very clear. Diminished interest can also be observed among mass users of the main crypto exchanges. Finance Magnates conducted a brief study on the popularity of the biggest trading venues in terms of the average volume. According to data provided by SimilarWeb, the usage data of the Top 5 venues shows a steep decline in the number of visits. 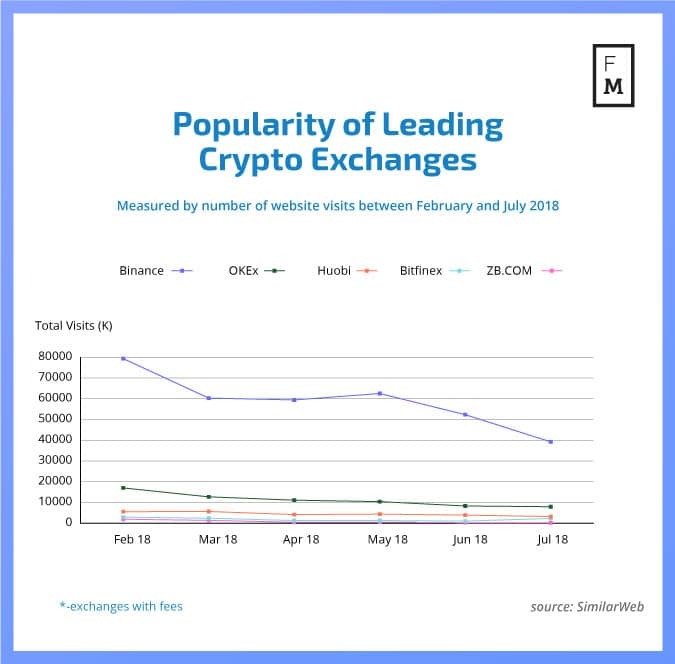 While Binance is by far the most often visited website among all leading crypto exchanges, the decline in the number of site visits is quite striking. In February 2018, Binance registered 79,3 million visits per month. In July 2018 it already had only 39.2 million visits. The remaining venues in our comparison share a very similar pattern of decline. Out of the ten leading crypto exchanges, ZB.COM registered the biggest decline. Between February and July, it lost 70 percent of its website traffic. The second biggest loser was Upbit, which shed 61.8 percent of visits. It was followed by Bithumb with a decline of 58.4 percent in traffic. There are however bright stars among crypto trading venues. China-based Lbank witnessed a growth in the number of visits of over 355 percent in the same period. Registered in Hong Kong, Coinsuper registered an even bigger growth of 700 percent. Coinsuper is a relatively new trading venue that was launched in 2017. Recently, some concerns were raised in the industry over the real nature of the volume growth reported by this crypto exchange. It does offer transaction mining, which is a form of reward system for trading. This should not be confused with fake volumes. Inflated volumes have been a problem for the crypto industry for a long time. Finance Magnates covered this topic in July in an article on the recently introduced CoinmarketCap requirements for listing. In the case of Coinsuper, our study could indeed confirm the real growth in its volumes. 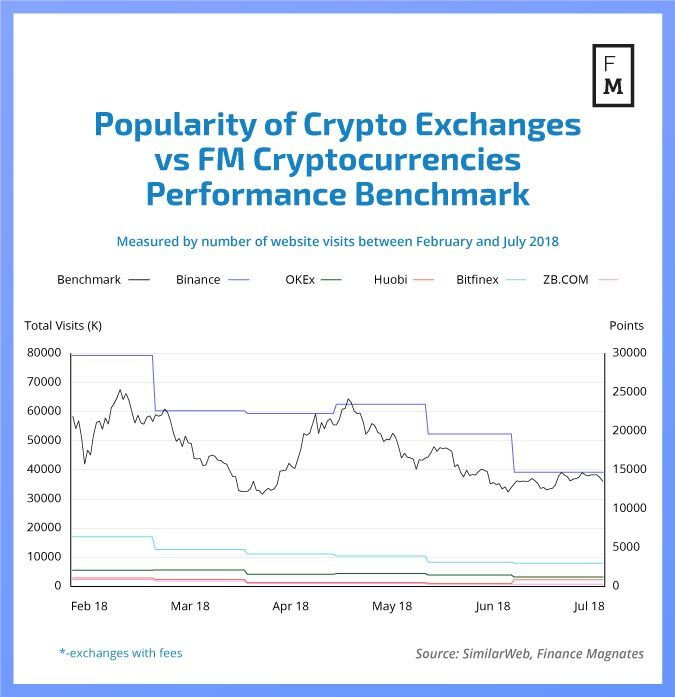 When the popularity of the Top 5 leading exchanges is compared to Finance Magnates Performance Benchmark one can observe a correlation between both. 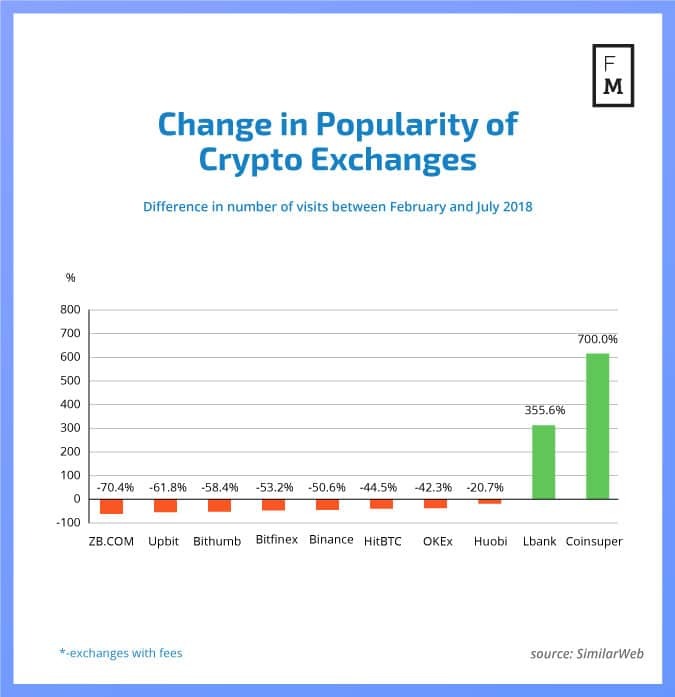 As the prices on main crypto exchanges decline so is the number of visits to main venues, confirming diminishing interest among mass users of cryptocurrencies. The Cryptocurrencies Performance Benchmark is a proprietary index of the Finance Magnates Intelligence Department aiming to measure the condition of the main cryptocurrency markets. It is composed of the four biggest cryptocurrencies by market capitalization and tracks their price change. Currently, these are Bitcoin, Ethereum, Ripple (XRP) and BitcoinCash. The initial value of the benchmark on September 30, 2017, was 5,000 points.